My trip home after leaving the USS Daly in Nagasaki, Japan, 1945. To start with, I enlisted in the Navy on December 7, 1942. I was 18 years old, I was sent to Great Lakes Naval Training Station. After completion of my boot training I was sent to New York and stayed in the Lido Hotel (taken over by the government) and was assigned to the Daly which was berthed in Staten Island, NY. The Daly was commissioned 10 March, 1943. After completion of being fitted out and a shake down cruise, the Daly left for the Aleutian Islands via the Panama Canal. She departed San Diego August 1943, and experienced her first taste of action 16 August as part of a Task Unit which was engaged in the assault and occupation of Kiska, Alaska. The Daly then departed for the South Pacific, stopping in Hawaii for repairs to damage suffered from a severe storm we encountered during the trip. The storm was so intense we all thought that the Daly was going to sink. After repairs our assignment took us to New Guinea, (January 1944) where we participated in the invasions of New Guinea and surrounding Islands and then the invasion of the Philippine Islands. After the Philippine Islands, we returned to the States to have the Daly overhauled. Then back to the South Pacific and the invasion of Iwo Jima (February 1945). From there we proceeded to the Okinawa Gunto Assault and Occupation (March 1945 until June 1945). When the war ended, we were sent to Nagasaki, Japan, to help rescue prisoners of war. While there we received word that if you had the required amount of points you could be discharged. About half the Daly crew was eligible for discharge having served aboard her from the day she was commissioned. I decided to leave the Daly in Nagasaki, Japan. The Engineer Officer had asked me if I wanted to stay aboard and get discharged when we got back to the States, or find transportation the best way I could. I told him I would take my chances with the rest of the crew that was leaving. there was going to be bag inspection. I think it was just a delaying tactic so we wouldn’t have time to get to the Hospital Ship before it departed. As I didn’t have any money, I sold my 2 blankets for $5.00. I couldn’t take them with me anyhow. We finally made it off the Daly and got aboard the hospital ship, I can’t remember the name. The next morning the Captain told us how proud he was to take us to the States, after all we had been through he was going to put us in a ward. We would have a nice place to stay. They were going to stop at Okinawa for a while and take on some patients, and then we would head straight to the States and in return he would like us to paint his ship while underway . I don’t know how it got started, but word got around that no one was going to paint. When we arrived in Okinawa, the Commanding Officer, Captain Steele, knowing we refused to paint his ship, literally kicked us off the Hospital ship. Not only did he kick us off, but also it was on the wrong side of the Island. We had no transportation to get to the other side where the ships were departing for the USA. Our only choice was to walk or hitchhike, so two other shipmates and myself hitched a ride with an army guy in a jeep. You know what they say in the service, they can’t make you do any thing, but they sure can make you wished you had. Well that’s about what happened to us. If only we had only painted the hospital ship, the rest wouldn’t have happened. After putting in for a ship, we were assigned a billet (a tent) across a creek and up a hill. As I remember it had already started to rain and we could hardly walk, as it was muddy and slick as ice. We told the Sergeant in charge that he was to put us up until we got a ship to the States. Some of the crew were lucky, they found passage back to the States before the storm hit. screen with a stage in front, or in trucks. We slept anywhere we could find shelter. While moving about we came across another tent area and found an empty one. We stayed there several nights. There was a Japanese tomb on the side of a hill above the tent area, where they buried their dead. We had been told not to go in them. I had already been in one before I found out. As we continued our roaming around the Island with nothing to do and a lot of time to do it, we came across a large tent. We went in to check it out and found there were some men already there. They told us they had not been bothered by anyone during their stay, so we joined them. begin to come off so I left again and got in a small tool shed that the CB's had used to erect the quonset huts. That shed was rocking back and forth and there were quite a few people in it, knowing if it blew down, some were going to get hurt I quickly left and got into another quonset hut, which was also full of people. That hut was sitting at a different angle than the one I had been in and appeared to be more sound. Some men were bringing in large cases of fruit, I hadn't eaten for around 48 hours but I don't remember being hungry. I guess I was too busy trying to keep my body and soul together. I got a large can peaches and a guy with a big knife helped open them up for me and the others. After eating, I wedged myself in between a large crate and the wall, with just enough room to lay on my side, hoping this quonset hut would not blow down and I went to sleep. The next morning I couldn't believe this building was still standing. I went outside, the view was shocking, everything around us was down, all the buildings even the mess hall, everything within sight was leveled. Two other guys and myself went back to a large fenced-in area that was being guarded by armed personnel. Inside were stored cases of K-rations and C-rations or I should say they had been there before the storm, they were now scattered everywhere. While searching about the area we found a case of K-rations, a case of C-rations and a hospital tent. We went back to where the tool shed had been, found a hammer, some nails and some boards, then made a frame. We cut all the Red Cross markings off the tent and made a shelter. This became our permanent refuge for the remainder of time we were there. Every day, we would go down to the staging area to see if we were assigned to a ship. Some one had to stay in or by the shelter we built to keep anyone from moving in. We never went back to where the mess hall had been. They were passing out K-rations and we already had them. A few days after the hurricane, I was lying in our tent shelter when I heard and felt a huge explosion. I went out and saw a mob of guys running toward a large column of smoke in the air. Several ambulances were heading toward the immediate area of the explosion. Later on I went over to see what had happened. The area I had stayed in a few nights with the tomb on the hill above the tent area had blown up. The concussion from the blast and the cement from the tomb had flattened all the tents in the vicinity and caused several causalities. I was just glad I had not been there when it happened. I recently found an article on the Internet describing the hurricane that hit *Okinawa October 9, 1945. There were over 200 ships blown aground in Buckner Bay. Several people were hurt, some killed, and some missing. I knew it was bad, but didn’t know it was that bad. After being on the Island for 18 days, I was finally assigned to a ship to go back to the States. They wouldn’t let you aboard unless you had a blanket, which I didn't have. I had also lost my sea bag, which had been on a large pile with other sea bags. The hurricane had blown them all over the place. I asked some guys if they knew where I could find a blanket and was told where I might get one. On my way, I found my sea bag; I couldn't believe my luck. I also was able to buy a blanket for $5.00 using the money I still had from selling my blankets when I left the Daly. That left me broke again, but at least things were looking a bit brighter. I was finally able to get on a ship and continue my voyage home. After several days we got to Treasure Island, California. Upon my arrival, I sent a collect telegram home for $20.00, which I received immediately. We were shipped to Great Lakes Naval Training Station and were discharged from there after a short stay. Before we got aboard the ship at Okinawa, everyone was given a "chit" or “Papers” that we could turn in and get new uniforms, shoes, etc. as most of guys had lost everything. After being discharged, I worked 3 or 4 different jobs, one at the Crane Naval Ammunition Depot in Crane, Indiana, in Boiler operation. I worked there for 30 years until retirement in December 1977. That Base is now known as Naval Weapons Support Center. After retiring, my wife and I started Furniture Upholstery Shop business that we worked for 10 years. We finally decided we had enough of the cold winters in Indiana and moved to New Port Richey, Florida, and we are still here. On 4 October 1945, a typhoon was spotted developing in the Caroline Islands and tracked as it moved on a predictable course to the northwest. Although expected to pass into the East China Sea north of Formosa on 8 October, the storm unexpectedly veered north toward Okinawa. That evening the storm slowed down and, just as it approached Okinawa, began to greatly increase in intensity. The sudden shift of the storm caught many ships and small craft in the constricted waters of Buckner Bay (Nakagusuku Wan) and they were unable to escape to sea. 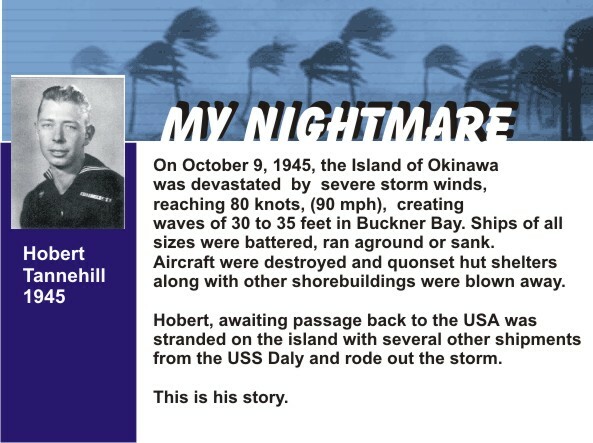 On 9 October, when the storm passed over the island, winds of 80 knots (92 miles per hour) and 30-35 foot waves battered the ships and craft in the bay and tore into the quonset huts and buildings ashore. A total of 12 ships and craft were sunk, 222 grounded, and 32 severely damaged. [for listing of vessels] Personnel casualties were 36 killed, 47 missing, and 100 seriously injured. Almost all the food, medical supplies and other stores were destroyed, over 80% of all housing and buildings knocked down, and all the military installations on the island were temporarily out of action. Over 60 planes were damaged as well, though most were repairable. Although new supplies had been brought to the island by this time, and emergency mess halls and sleeping quarters built for all hands, the scale of the damage was still very large. If the war had not ended on 2 September, this damage, especially the grounding and damage to 107 amphibious craft (including the wrecking of four tank landing ships, two medium landing ships, a gunboat, and two infantry landing craft) would likely have seriously impacted the planned invasion of Japan (Operation Olympic).